Plot – Living her life as a student at a catholic high school in Sacramento, teenager Christine “Lady Bird” McPherson (Ronan) struggles to come to grips with her incoming big life decisions, her relationship with her mother Marion (Metcalf) and her new found love life with fellow students Danny (Hedges) and Kyle (Chalamet). Not many films from 2017 were as universally adored as Greta Gerwig’s loveable directional debut Lady Bird. At one (very brief stage) holding the record on review aggregate website Rotten Tomatoes for the best reviewed movie of all time (a title that now unbelievably has been passed to Paddington 2), Lady Bird is one of those films that would be incredibly hard to dislike thanks to Gerwig’s fun and humanly in-touch script, as well as a collection of flawed and believable characters that will surely be relatable to many a viewer upon watching. Likely to receive this year’s Academy Award for Best Original Screenplay, its due to Gerwig’s fine work as a screenwriter and poise as director that Lady Bird has been heralded in as it has been by critics and audiences, as Gerwig’s core story and delivery isn’t anything new by any stretch of the imagination. Telling a story we’ve all seen before, Saoirse Ronan’s Christine “Lady Bird” McPherson dealing with life leading up to college, that includes the usual relationships and tension with her mother Marion (played brilliantly by Oscar nominated Laurie Metcalf), Gerwig manages to bring a fresh and insightful approach to the coming of age dramedy that will make you laugh in one moment, and feel a tinge of genuine sadness and emotion in the next. Honing her craft as an actress with key roles for directors such as Noah Baumbach and Mike Mills, Gerwig has shown herself to be a director and screenwriter of much talent with this experience, that includes her direction of another noteworthy Ronan turn. Rightfully nominated for Best Actress at this year’s Oscars, Ronan once again proves she’s one of the industries brightest young stars. Instilling Christine with the perfect balance of sass, smarts, honesty and vulnerability, Ronan is perfectly in charge of her performance and she elevates the film as a whole with her presence that particularly shines whenever she and Metcalf get a chance to share the screen as the mother and daughter duo that’s so integral to the heart of Gerwig’s debut. 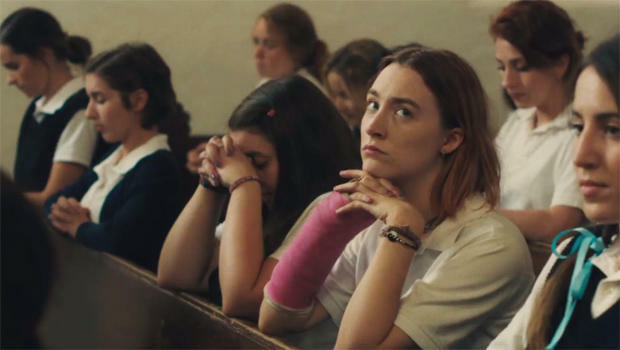 Never outstaying its welcome, Lady Bird is a fun, fast and touching portrayal of growing up and learning to come to terms with the world and while not breaking any new ground, Gerwig’s debut suggests the leading lady has a very bright career behind the camera lying ahead. Tight review, mate. Loved this movie — probably my favourite of the Best Picture noms. It would be a hard film to dislike man. I know a lot of people that feel in love with it.